Mahmood Farooqui returns to his alma matter, Doon School, Dehradun for a performance of Dastangoi on Saturday, August 28, 2010. We're in for some experience. Mahmood wrote this piece fours years ago for Himal. Thursday, the 5th August at 2.30 pm at NSD, Bahawalpur House, Bhagwan Das Road, N. Delhi. The Mentor and Founder of Dastangoi, S. R. Faruqi may attend. When Delhi lay under siege for five harrowing months in the summer of 1857, the people of the city described the events as ghadar: a time of turbulence. Resources within the besieged city fell dangerously low and locals found the rebelling sepoys’ presence and the increased levies insufferable. Nonetheless, an extraordinary effort was launched by the government of Bahadur Shah Zafar to fight the British. Thousands of labourers and tonnes of materials were mobilized, funds were gathered, the police monitored food prices and a functioning bureaucracy was vigilantly maintained—right until the walled city’s fall. Then, as Delhiwas transformed by the victorious British, these everyday sacrifices and the efforts of thousands of people to save their country were lost forever. In this groundbreaking work, Mahmood Farooqui presents the first extensive translations into English of the Mutiny Papers—documents dating from Delhi’s 1857 siege, originally written in Persian and Shikastah Urdu. The translations include such fascinating pieces as the constitution of the Court of Mutineers, letters from soldiers threatening to leave Delhi if they were not paid their salaries, complaints to the police about unruly soldiers, and reports of troublesome courtesans, spies, faqirs, doctors, volunteers and harassed policemen. Shifting focus away from the conventional understanding of the events of 1857, these translations return ordinary and anonymous men and women back into the history of 1857. 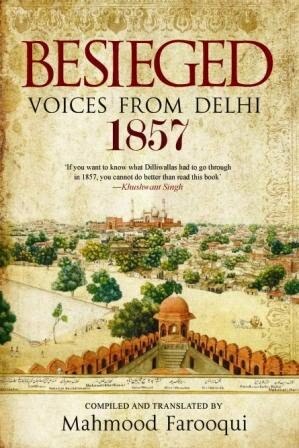 Besieged offers a view of how the rebel government of Delhi organized the essential requirements of war—food and labour, soldiers’ salaries, arms and ammunition—but more than that, this deeply evocative book reveals the hopes, beliefs and failures of a people who lived through the tragic end of an era. Photograph and the write-up courtesy Penguin Books India.